Although not explicitly stated climate change resilience sits at the heart of all of the Thames Estuary Partnership’s activities. Our core vision is for a sustainable Thames Estuary, with that sustainability based upon inclusive representation of the dreams, views and worries of all those who live, work and play in the catchment of the tidal Thames. Our core operational paradigm is that of integrated water and coastal management. Essentially this means equally valuing the contributions and objectives of all sectors that constitute the three main areas of economy, safety, and ecology, and to ensure this we maintain a neutral stance. Clearly climate change will affect all three areas but we often tend to focus on the main impact it will have on the complex interdependent systems at play in the Estuary; and that is sea-level rise. Rising tides will impact sea defences, will affect port safety, will damage fragile ecosystems, and will ultimately cost more to deal with at a later date, than if they are effectively managed from today onwards. The key project for us to follow at the moment is the Environment Agency’s TE2100 Flood Risk Management Plan. This plan was the first piece of government legislation to actually place climate change at the heart of its structure. The plan proposes an adaptive response to climate change, an essential step since we don’t know how fast sea level will rise. 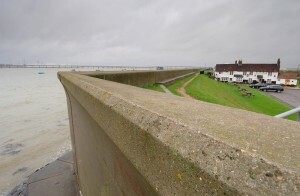 The Thames flood defence system is currently more than fit for purpose, as was shown during the storm surges of December 2013 where even though the magnitude of incoming waters was as bad as that seen in 1953, which resulted in significant loss of life, last year there was not even a single breach of the defences in the Estuary. But large surge tides may not always be so predictable and the TE2100 Plan proposes solutions, both social as well as technological. For the Thames Estuary Partnership a strength of the plan is that it was formed in partnership, will be run in partnership, and will develop solutions that will be approved and managed in partnership. But most Londoners don’t ‘get it.’ To them flood-defense is a simple process of keeping the waters back, and that’s what the (Woolwich) Thames Barrier does, isn’t it? Well no. The defences are a system of 10 barriers, many miles of flood wall, numerous pumping stations, and dozens of controlled sluices and privately owned flood walls. Co-ordinating this lot is no easy task, and is not made any easier because of people’s failure to recognise the complexity or the cost of the system that assures their continued safety, and that of the Estuary’s communities and port facilities. The mainstream media barely helps. There is virtually no coverage of the marine industry of the Thames. Most of our commodities enter this country by ship and the Port of London is the second largest port in the UK. We have lost as much as 25% of our salt marshes, vital estuarine habitats, over the last 30 years. Yet vast swathes of replacement habitat might be created through managed realignment – effectively surrendering some of the land in the Estuary back to the sea from which it was reclaimed centuries ago. 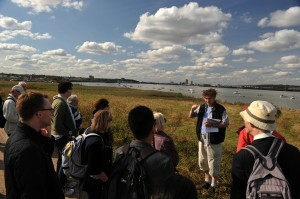 One view of Thames Estuary Partnership is that people won’t ‘get it’ until they ‘stand in it.’ Our approach is to tell people about the complex interconnectedness of the Estuary’s problems, and their potential solutions, while they are actually standing in a salt marsh, or on a boat cruising past Tilbury Docks, or walking along a flood defence (few people know they are until you tell them what they are standing on). So rather than relying on newsletters, emails, and networking events alone, we also take people out to ‘Get in touch with the Estuary’ through partnering with other organisations. The Thames Estuary Partnership are running a suite of events for September 2014’s Totally Thames Festival. We are leading walks, giving talks and organising boat trips that emphasise the connection between the river and its surrounding communities. 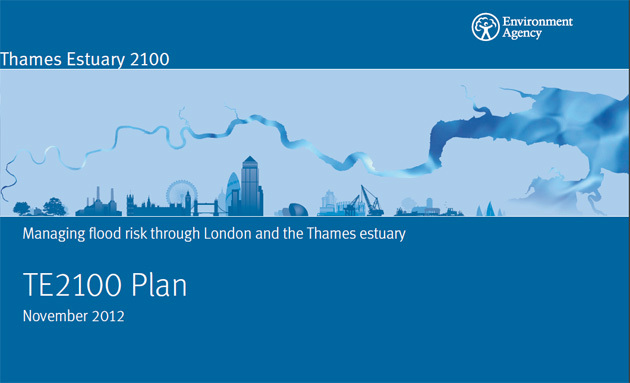 We foreground the flood defences as the great infrastructural works that they are, point out previous and future natural and constructed habitats, and explain the historic and contemporary role of shipping to the financial powerhouse of the City of London. For the third year running we will also contribute to the 20 year old London Open House weekend in partnership with the Institution of Civil Engineers (ICE London). Open House was set up to invite the public into great examples of architecture, to allow us to ‘feel what components of the built environment are like by being inside them’. It is this approach that values the embodiment of knowledge through experience that we aim to extend over the coming years. Climate change needs to be touched to be understood.